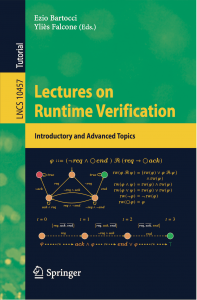 Lectures on Runtime Verification – Yliès Falcone, Ph.D.
We are happy to announce our Springer LNCS tutorial book, Lectures on Runtime Verification – introductory and advanced topics, co-edited by Ezio Bartocci and myself. The book is available on Springer Website. The book contains introductory and advanced lectures on Runtime Verification authored by members of the COST Action IC 1402, ArVi, Runtime Verification beyond Monitoring. Monitoring Events that Carry Data. Runtime Failure Prevention and Reaction. Specification-Based Monitoring of Cyber-Physical Systems: A Survey on Theory, Tools and Applications. Ezio Bartocci, Jyotirmoy Deshmukh, Alexandre Donzé, Georgios Fainekos, Oded Maler, Dejan Nickovic, Sriram Sankaranarayanan. Runtime Verification for Decentralised and Distributed Systems. Industrial Experiences with Runtime Verification of Financial Transaction Systems: Lessons Learnt and Standing Challenges.